A simple meat and potatoes dish. A traditional cottage pie is made with ground beef and topped sliced potatoes. 2. In a large skillet, heat butter over medium. Add onion carrots, garlic and cook, stirring often, until onion is soft, 5 minutes. 3. Season with salt and pepper and stir in tomato paste. 4. Add meat and cook, breaking up with a wooden spoon, until almost cooked through, 3 minutes. 5. Add thyme, Worcestershire sauce and beer(or beef broth) and bring to a boil. Cook, stirring frequently, until slightly reduced, 2 minutes. (At this point, I poured out access oil - leaving about tablespoon). 6. Sprinkle flour over mixture and stir to combine. Slowly add 1/2-3/4 cup water, stir and cook until mixture thickens, about 2-3 minutes. 7. Stir in peas and green beans and season with salt and pepper. 8. Transfer mixture to a 2-quart baking dish. 10. Top the meat mixture with potatoes, overlapping slices. 11. 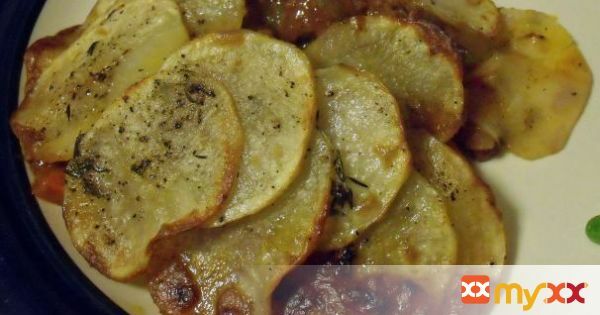 Bake until potatoes are browned around edges and tender when pierced with a knife, 40 minutes. Place under the broiler for 5 minutes or until the potatoes crisp. Allow to cool 10 minutes before serving.